Summer is quickly nearing its end, and with it another chapter of Hall-Hoag work. This summer, with the help of a great team of student workers, the last of the letter boxes were put in continuous alphabetical order. The students, in small teams, worked on some of the largest groups of letters (A, C, and N) and some of the smallest (Q, W, Y, and Z). During this work, the students were able to consolidate the “A” boxes down from 106 to 95, the “C” boxes down from 168 to 153, and the “N” boxes down from 111 to 105. Through this continuous alphabetizing the collection was further condensed by 30 boxes creating more organization within the collection and less unnecessary boxing. If you have been an avid Hall-Hoag follower, then you are aware what continuous alphabetical order is and how hard the students worked to achieve it. To bring anyone new to the blog and project up to date, continuous alphabetical order requires alphabetizing all of the folders containing organizations of one letter. The C’s, for example, contained over 24,000 folders in 168 boxes. 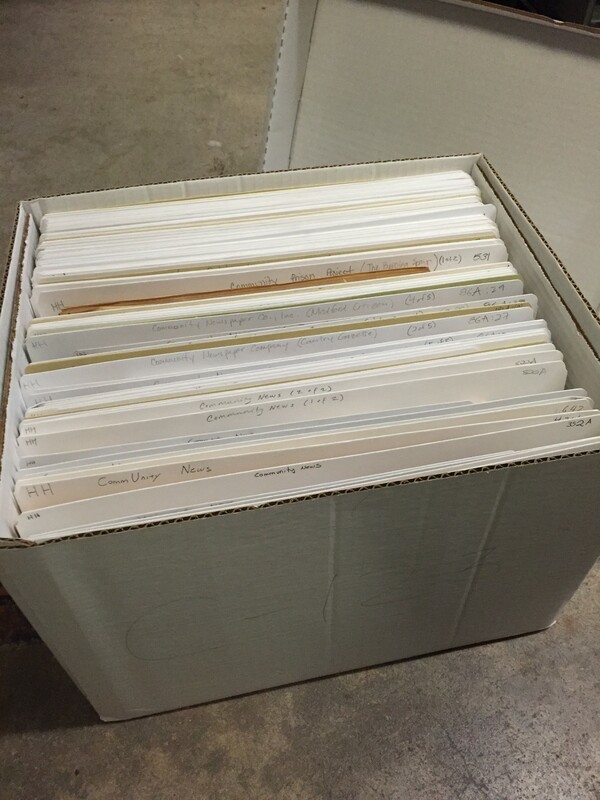 These folders were alphabetized within each individual box, but not across the entirety of the “C” boxes. The students had to first go through all 168 boxes, and organize the folders in small groups creating perfect, continuous alphabetical order from box 1 to box 168. They then had to re-box the newly alphabetized folders, and lastly go through and update the database with the new (and final) box number. The work may sound monotonous, but it is work vital to systemizing the collection in the best way possible for researchers and the like. Arranging in continuous alphabetical order and updating the database to reflect the location of each folder makes research much more efficient. 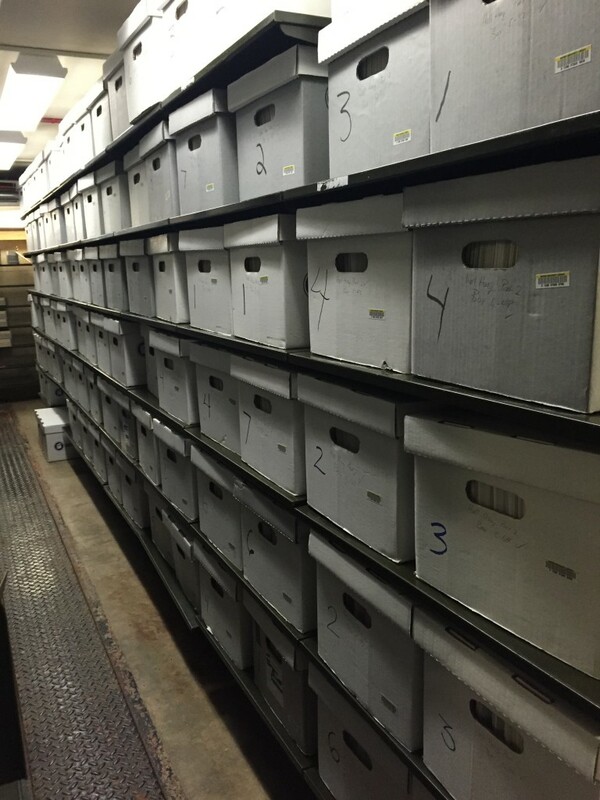 When a researcher visits the Hall-Hoag website (coming Winter 2015), they will be able to click on an organization, see all of the folders in that organization, as well as which box they reside in, making re-calling the boxes from offsite storage much easier. The inside one of the perfectly alphabetized, correctly filled “C” boxes. “C” boxes numbered, alphabetized, and ready to be shipped back to the Annex. The work that was completed this summer allows us to move forward with the next and final projects of the Hall-Hoag Collection. With a team of student workers we will focus on researching the roughly 30,000 organizations found in the Hall-Hoag collection. This research will include finding any background information on the organizations, as well as searching for its VIAF (Virtual International Authority File) as well as its Library of Congress linked data authorities or other vocabularies. The information supplied from our student workers will be imported into the FileMaker Pro database, which will eventually be exported and updated on the website. I think that should be all for now. Looking ahead we have some great organizations to be highlighted in the coming weeks, so stay connected for more Hall-Hoag!